Waiting on Snow and Ice tonight and tomorrow !! BLAHHHHH!!! Formerly Northeast Missouri, now transplanted Okie since '99. More white stuff today. Sporty is wimpering from non-use. Took a run out the other day as it was a beautiful day, got away for a couple of hours run, took a couple of photos, this one at the mouth of Lough Foyle where the ferry crosses from N. Ireland to Southern Ireland which is further north than N. I! 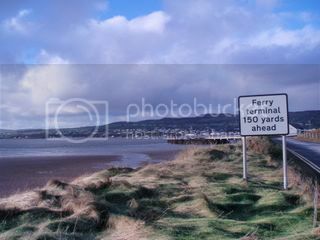 The ferry goes from Magilligan Point in Co Londonderry to Greencastle in Co Donegal. Here's a few old pics I just came upon recently that best illustrate still my favorite stomping grounds for riding. Local indeed and only about 30 minutes from my home. BTW, It amazes me how my Sporty has changed thru time and continues to do so. I guess we just can't be satified or leave these things alone Huh? Still BIKELESS & hating Life! Gone to the "Dark Side"
Swankster, you're in Clovis? My girlfriend's dad has a house in Sanger. We're there all the time. We need to hook up and ride! Cool! then your'e familiar with Pine Flat I presume? I usually take the 180 east past north Sanger to Trimmer Springs Road up to and beyond the lake. It looks to me your'e a beer drinker too! BTW, I visit the Monterey area often as I do alot of work in your neck of the woods. Also, My Bros live in Marina, Santa Cruz and Scotts Valley. I haven't ridden Pine Flats yet. In fact, the last time I rode in your area, I blew out my rear tire doing 50 down Bethel. Scary sh*t there! We need to get together and ride sometime. Oh yeah, I'm a beer drinker!!!!!! I was gonna ride out to Sanger tonite to see my gal, but the forecast calls for rain tomorrow. I'll PM you next time I'm gonna be in town, do the same when you come this way!